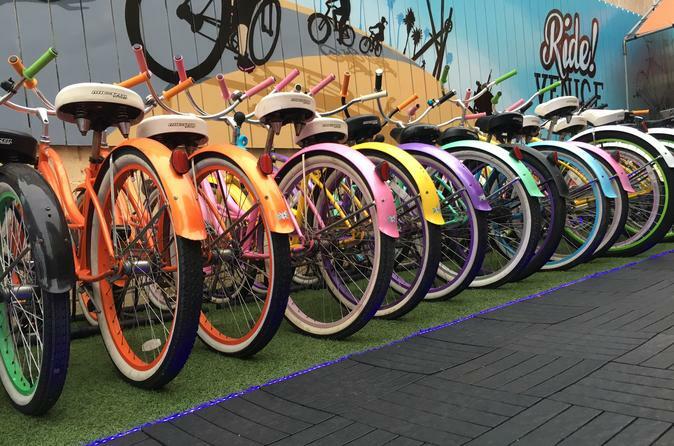 Rent a colorful cruiser bike right on the beach in Venice, then head down The Strand bike trail with friends or family. Explore beach towns such as Manhattan Beach and Hermosa Beach or head north to Santa Monica and its iconic pier and amusement park. The level, 22-mile long Strand runs along the ocean and affords gorgeous views of the Pacific as well as the lively culture of the boardwalk. Keep your bike rental for up to 24 hours. Locks, baskets, lights, and helmets for the kids are all included. Stop by our bike rental shop right on the beach and pick out your classic California beach cruiser. It's yours for 24 hours, so feel free to explore the picturesque surface streets of Venice and Santa Monica. Or head out to the Marvin Braude Bike Trail—known to locals as The Strand—a wide, oceanside bike path that glides along the coastline for 22 miles. Pass beach towns like Marina Del Rey, Manhattan Beach, and Hermosa Beach, or head north to Santa Monica Pier with its lively amusement park. This is by far the best way to enjoy the west side of Los Angeles and its beautiful beach culture. Locks, baskets, lights, and helmets for the kids are all included in the price. We're conveniently located in front of the tennis courts on the beach in Venice between 19th and 20th avenues. Return your bike to the same location up to 24 hours later. Our staff speaks Spanish, French, Italian, German, Portuguese in addition to English.